The Heighley Gate garden centre near Morpeth has signed up to become a Dementia Friend of the town. Management and staff have pledged to offer whatever support they can to visitors with dementia. Guy Kirk, owner of Home Instead Senior Care South East Northumberland, Café des Amis owner Wendy Smith and Tony Woods of the Justice and Peace Church group in Morpeth started the project with the support of the Alzheimer’s Society. Heighley Gate staff have already taken part in two information sessions delivered by Mr Kirk. Along with several members of a working group that has been set up to promote the initiative, he wants to recruit 282 ‘friends’ – individuals and businesses – to support people with the condition. The precise figure is based on the fact that research by the Alzheimer’s Society has shown that one in 14 people over the age of 65 are living and coping with dementia in this country. 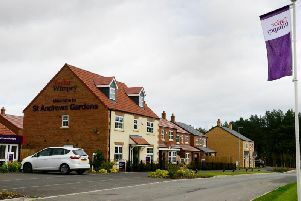 For a town the size of Morpeth, this could mean 282 residents in the area have dementia. Mr Kirk said: “There are small things businesses can do that would have such a big impact on improving accessibility and understanding the needs of people with dementia to continue enjoying shopping, visiting banks or leisure facilities in Morpeth. The group has arranged a public meeting that will take place in Morpeth Town Hall on Thursday, September 20, from 6pm. Those attending will be able to find out about what it is like to live with dementia, as well as sign up to become a Dementia Friend. Shops and other businesses that want to get involved in the initiative will be encouraged to think about how they can make small changes that would help people with the condition, starting by sending along some members of staff to the forthcoming information session. Heighley Gate’s horticultural manager, Nigel Lawton, said: “As a business that welcomes large numbers of visitors through our doors each year, we know that some will be affected directly or indirectly by dementia. “So we felt it was appropriate that we establish our centre as a friendly place to visit, with staff who are both understanding and able to offer support as required to people with dementia.